Getting a small blender will help you out in many ways. After all, it’s small, so that means less counter space taken up in your already-packed kitchen. Plus, depending on your family size, you may not have the need for a large blender, so a mini version can get the job done with ease. Acquiring the best mini blender can do so much for you as you work in your kitchen, preparing meals and snacks. Sure, we know that a single serve blender can whip up the greatest smoothies and shakes you have ever tasted. But did you know that your blender can also help you make the best soups, guac, and salad dressings? It’s absolutely true! Truth is, I use mine mostly for protein shakes and fruit smoothies, but I have been known to use it for other stuff, too. Part of a soup recipe I was making involved blending squash until it was finely pureed, and my little blender proved to be an excellent workhorse in making sure that soup had the correct consistency. It tasted great, too! So, don’t let your confusion control you! Come along with us and have a look at the top picks for a great personal size blender. So, What Exactly Is the Best Small Blender? Well, there’s really no specific definition of what is the BEST small blender. It’s really about what you seek. After all, you are probably here because you love smoothies, protein shakes, and living a healthy lifestyle. Maybe you are looking to turn over a new leaf and get healthier by consuming delicious shakes and smoothies instead of unhealthy processed foods. Many of them can handle all kinds of foods-everything from soft fruits to even the tough stuff, like nuts or chunks of ice. There are plenty of amazing recipes available right on the Internet-it might behoove you to take a look at the recipes and then purchase the blender that suits your favorite mixtures. 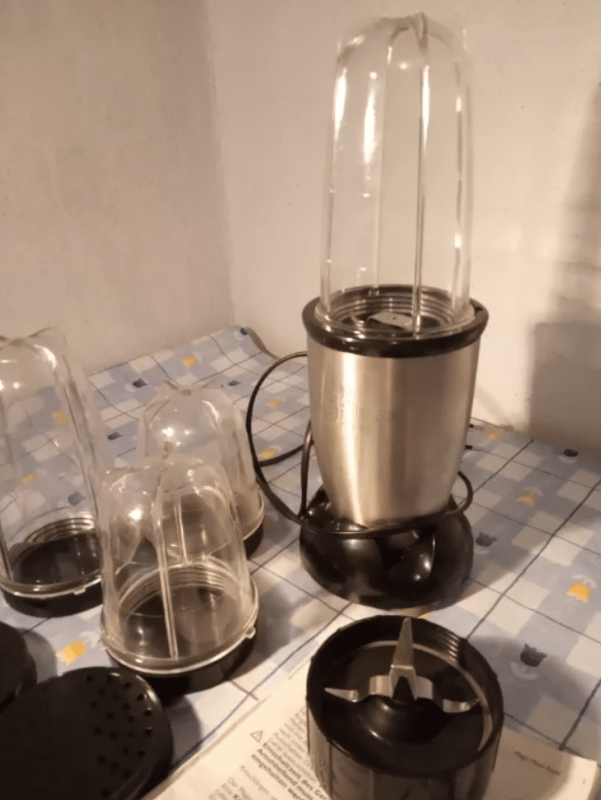 For example, the Ninja blender we reviewed handled nuts like a champ, whereas the Oster 250 Watt recommended that the ice you put into it be crushed. 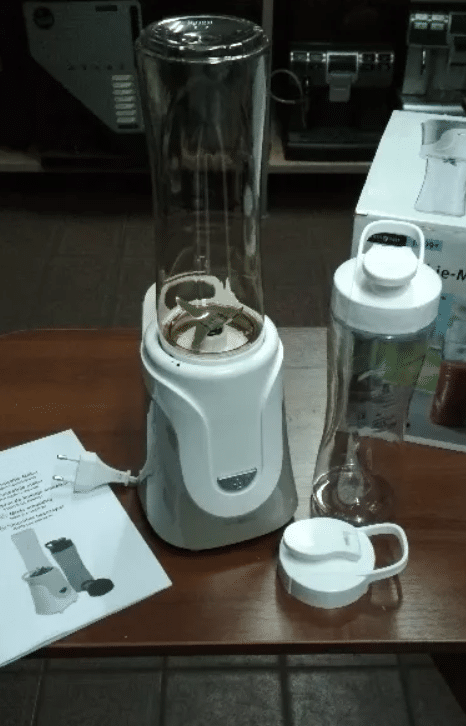 The Epica blender, reported one customer, came with a warning not to use the blender to crush ice. You can definitely see the differences here! If it’s small counter space you seek, nearly all of these blenders will suit your need. If you need a travel blender with a cup that you can take with you on the go, check out our Oster 250-Watt Blender review, or the Epica review at the very end. As the consumer, be sure to take a close look at each and every detail to make sure you get what you need. Our post here makes it easy. It takes a look at top-rated products and tells you about the finer points-and the not so finer points- of each one. The goal is not to sway your opinion, but to inform you of the different options and solutions that are available to you. 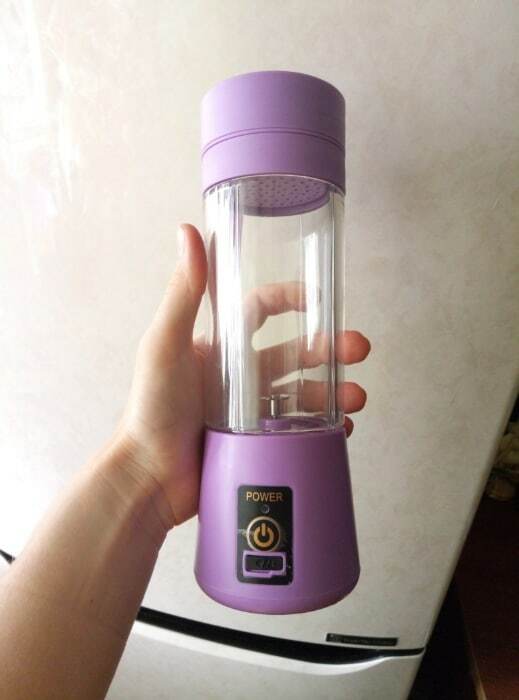 Why Should I Get a Portable Blender? Well, chances are you are looking for a way to enjoy your favorite fruit smoothies or protein shakes on the go. You may spend lots of money at a local juice bar or hit up the shake counter at your favorite gym when you’re all done working out. Doing this can make for a nice treat once in a while, but it really adds up over time. Doing some brief research will give your insight into some great blenders you can bring home and set up, so you can start saving those hard-earned dollars. If you are a pro athlete, or somebody who takes nutrition seriously, a portable blender will save your bacon when you are on a trip with family and friends. While others eat their meals, you can resist temptation by mixing up a nice smoothie or shake from the comfort of your hotel room or vacation home using your travel blender. 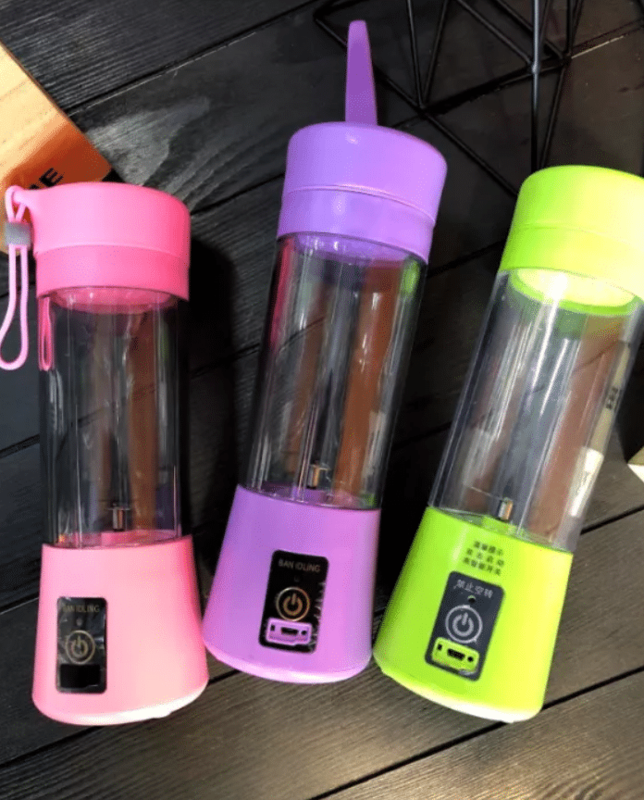 For parents, a portable blender may just be their saving grace-parents can get their kids to eat their fruits and veggies by mixing them into colorful smoothies that kids can take with them on the way to school or sports. A user that stated this was the only way she could get her kids to take their fruits and veggies-so if you are a mom or dad, consider this a neat way to get your little ones healthier! Let’s take a look at some great mini blenders! The MyBlend from Oster is just adorable to say the least! It comes in a variety of cool colors to go with your living situation. No matter your kitchen’s color, they’ve got one to match. 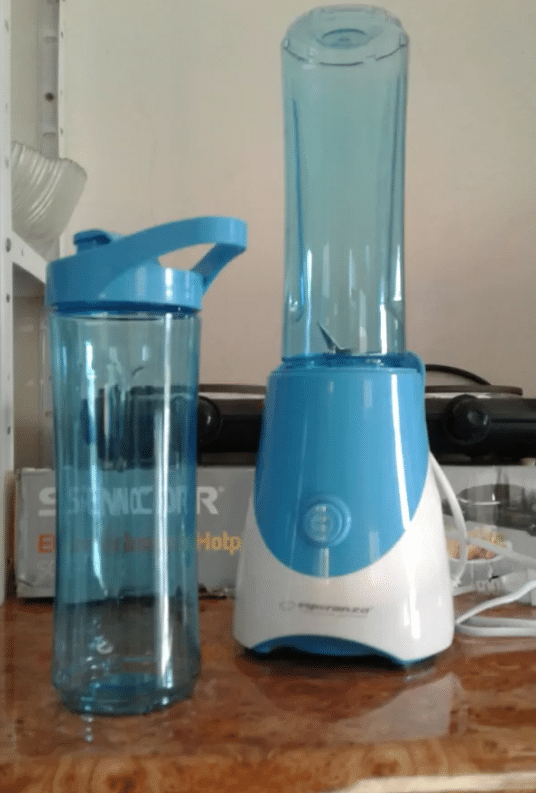 It is an individual sized blender and sports bottle all in one. It’s made for those of us with active lifestyles, making it a great travel blender. 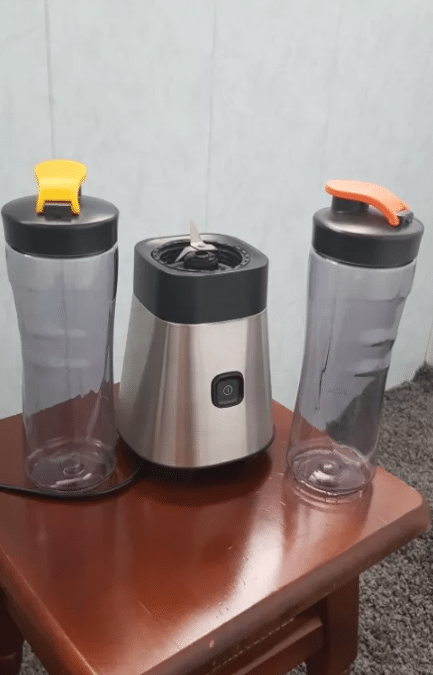 It features One Touch blending, helping you to create the best smoothies, protein shakes, and other recipes that you can simply take with you on the road, on a jog, or to work. This MyBlend feature is really cool. It allows you to customize the contents of your blended drink. You can control the ingredients! All you have to do is fill the sports bottle with all the ingredients from your favorite recipe, blend it, and then go on with your day. After the shake or smoothie is all gone, use the sports bottle throughout your day to keep your water intake up or fill it with other great beverages. If you’re at a picnic, for example, but somebody forgot the cups, you can just fill up your bottle with water or iced tea! If you are an athlete, you can fill the bottle with Gatorade or other sports drink while at practice and keep on. It’s got a three-year satisfaction guarantee and a one-year limited warranty too-makes for worry-free buying. 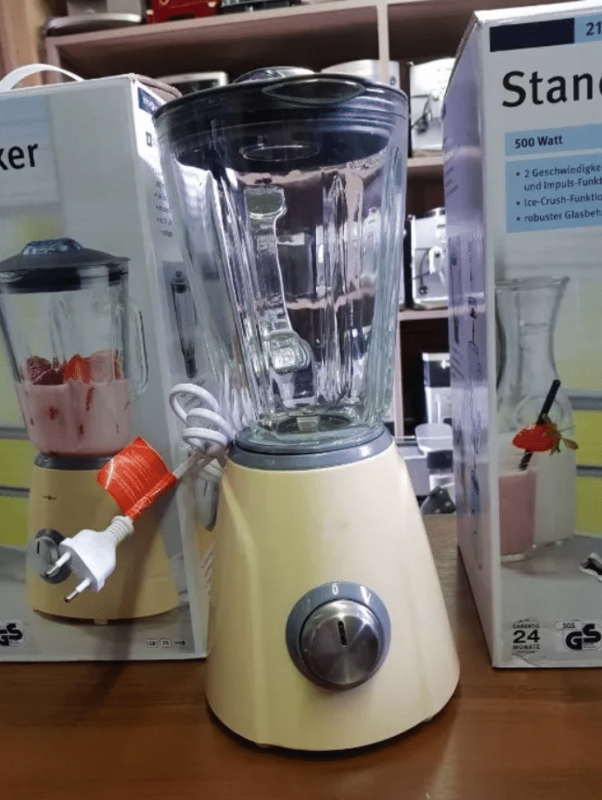 This is a compact blender ideal for consumers that are busy and, on the run, consumers of smoothies and shakes, and those who are health-minded. The bottle itself is 20 ounces, BPA free, and goes into the dishwasher with no worries. It fits into most car cup holders. And storage is a breeze as this blender stores easily on the countertop, taking up almost no space. These and other great recipes are a piece of cake with this great little blender. Sports bottle is so nice and handy to carry around and use all day! 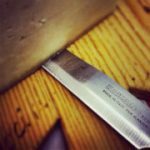 Blades are super tough stainless steel. You can pulse if you want it to, just to press and release constantly for the pulse feature. Can be hard to pull out the bottle after making smoothies. Make sure you turn your bottle a bit before trying to remove. Needs a good amount of liquid to get things to blend properly. Can cut ice, but you will need crushed ice for best results. 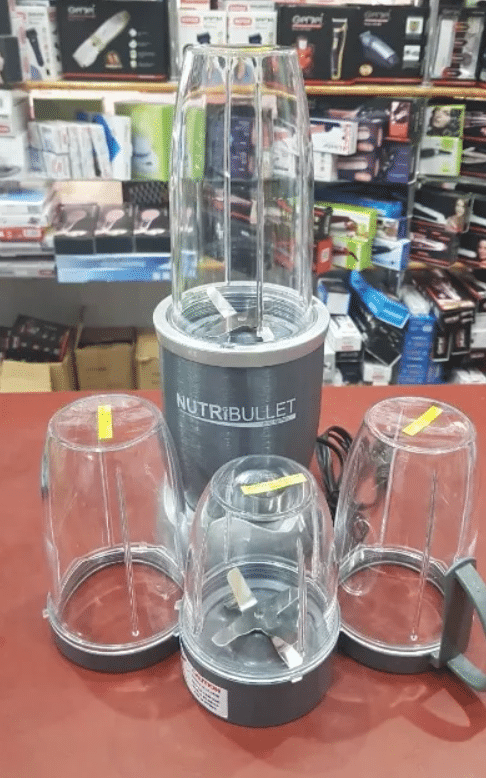 The Bullet brand of blenders is one that makes all of us seeking a great single cup blender smile because the quality is simply unmatched! This lovely little blender takes up a tiny amount of counter space but gives you the best in speed and versatile uses. The photos of this blender show the product surrounded by foods many of us like to eat: fruits, avocado, and other assorted veggies. It’s a good sign! It is so easy to use and helps you make all the healthy foods you enjoy. You can load up some chickpeas and spices and create the tastiest hummus ever. You can put fruit in along with yogurt and get a smoothie whipped up in no time flat. All you need to is load the ingredients into the cup, twist on the blade, and make sure the tabs are all lined up. Then you put it on the power base and get blending. This neat little gadget does it all-blends, grinds, whips, and mixes. If you are in a hurry, you can take whatever you made with you on the go using the Flip Top to Go Lid. To clean this, all you need to do is rinse it with soap and water. The cups can be put on the top rack of your dishwasher with no worry. Your personal sized blender also comes with a handy bonus called “10 Second Recipes.” It’s a guide that shows you how to get started making appetizers, desserts, and everything in between that are fast, easy and tasty. Can do so much, even chop up nuts. Hello protein and healthy fats! Power Cord operated-no need to change out batteries! Grinds up coffee beans, too! Only makes enough for one person – fine for a personal sized blender, but you may need more if you have two people. Only rated for 120 volts-this is a problem for those that live in countries with 220-volt outlets. One customer reported that the blender cannot run for more than 60 seconds or it will overheat. This is a great blender that does so much! Ninja is known for being really good at what they do, and the Nutri Ninja Pro is no exception. You get powerful extraction of all nutrients and vitamins when you put your fruits and veggies inside this amazing blender. This is known to extract “hidden nutrition” from whole veggies and fruits. A strong 900 watts of professional-grade power breaks down the vegetables and the fruit, so you get nutrient-filled juices very quick! The blades on the Ninja Pro Extractor crush everything: seeds, ice, stems and skins for a blend that is of even consistency and smooth to the taste. Just twist the trademark Sip and Seal lids on and you are ready to take your healthy creation with you on the go! Everything is BPA free and safe for use in the dishwasher. Rated 4.5 out of 5 – customers love the ease of use and how easily it chops everything up that goes inside. Super easy to clean-just wash the cup by hand or put it in the dishwasher. The most versatile out of all our blenders-it chops up EVERYTHING! If you want a bigger cup, it is an accessory. This is nice, but sometimes these things are better when they come with the product. Some customers report a black substance coming out of the bottom after usage. It certainly does a great job chopping but customer report it being very loud. May not be a great choice if you share your home with several people. Here we have another great small smoothie blender whose small size makes no difference in how it performs! It is a personal size blender that is here to serve all your health nuts and smoothie lovers, and everybody in between. Whether you seek to start a green smoothie cleanse or consume protein shakes as a bodybuilder, this personal sized blender is here to save the day. It will become a valued friend in your quest to be healthy! It is specially made to fit in most cup holders found in cars, and travels oh so easily with you on your commutes to work, school and the gym. This thing is also what we might call a jack of all trades-it chops nuts, makes purees, creates fluffy whipped cream and can even make you a frozen cocktail on those nights that call for a special celebration. The plastic cup is BPA free-no harmful chemicals here. Your drinks will not taste funny, like plastic or otherwise. No cheap plastics means a healthier experience for you and your family. The nice flip top lid seals super tight to prevent any spills from happening. You can tote it along in a purse or bag and have no worries about spills…how cool! Plus, the jar is very resilient-it withstands temps from -40 degrees F to 175 degrees F.
As if all that wasn’t enough, there is a 2-year warranty on the product as well. Therefore, you can buy with confidence. The motor has the power of 300 watts, and torque of 23,000 RPM. Whatever you put in there is no match for the Epica. Indeed, this blender makes it super easy to stay on track as you go along. There’s no need for you to stop at a fast-food joint or gas station in order to get your smoothie fix when you’ve got the best mini blender right at your fingertips! Plus, the way it rides so easily in your car means no mess or worry about making a spill while you are riding along. Low Maintenance and easy to clean! Just rinse the blade after you use it and leave it there to dry. Wash the bottle and cap after use. Takes up very little counter space, very helpful for those with small kitchens or work areas. Customers report that smoothies were able to be blended with little to no effort, and with few to no lumps. Customers report that the blender does not do well with ice. One reported having to let fruits and veggies defrost a bit. The blender only ranked a 3.1 out of 5 on the durability scale. While this is a good score, this may be concerning to some. Narrow container makes it hard for the blades to blend the products inside. Finding the best mini blender isn’t so hard when you’ve got the right guide to get you there! No matter your purpose for owning one, we hope our guide has given you some insight on which one will suit you best. Pretty soon, the only complicated decision you make will be what delicious creation to make next.